The following chart shows CPATAX divided by GDP from 1947 to present. The black line represents the average from 1947 to 2002, and the green line represents the average from 2003 to 2013. 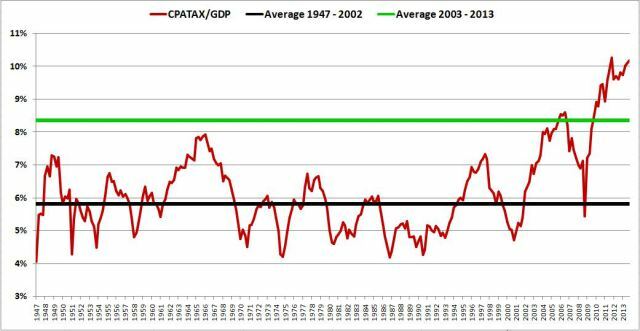 As you can see in the chart, CPATAX/GDP is wildly elevated at present. It currently sits 63.3% above its average from 1947 to 2013, and a whopping 75.0% above its average from 1947 to 2002. Can you help me understand one aspect of ROE? In Indian companies, some of the companies have ROE < ROCE. 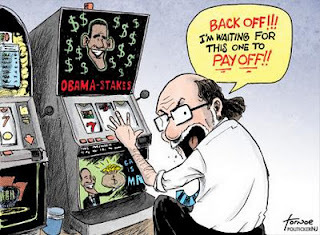 Isn’t that a violation of the observation that ROE ~ ROCE times Leverage. I define ROCE as Return on Capital Employed. I use ROCE as a measure of the attractiveness of the industry and the company. High ROCE is good, implying a moat, low ROCE is not. There is a slump sale of a division, and thus suddenly huge amount of profit has come in increasing inordinately the average shareholder equity. So suddenly the effective leverage has dropped. I made a mistake in describing ROCE. In my defense, I dont exactly calculate ROCE and merely use the numbers from screens. ROCE = EBIT(1-Tax Rate)/ Total Assets and not EBITDA as mentioned before. 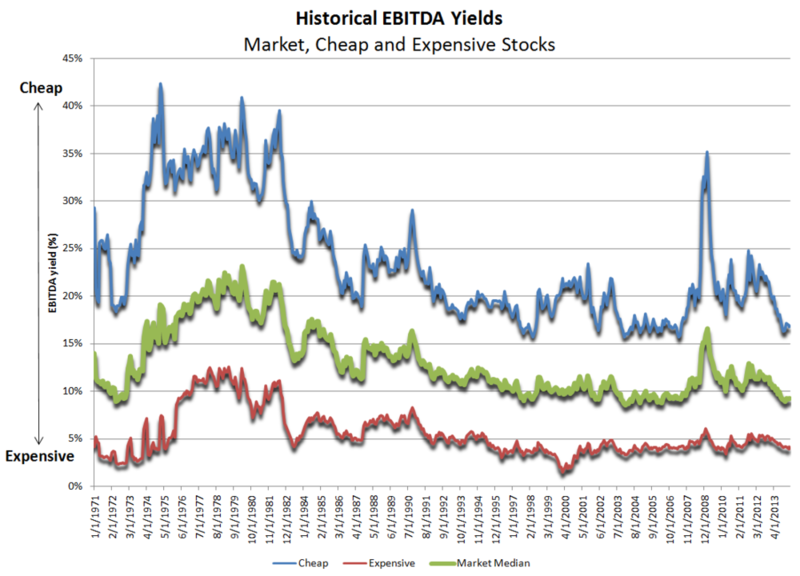 More on WMT: A reader posted this in the comment section: http://www.fool.com/investing/general/2014/04/28/why-is-wal-mart-failing-in-emerging-markets.aspx. Does that article even touch upon the ture nature of WMT’s competitive advantage? No wonder the obvious is overlooked. We literally called Jon Corzine. We called Jon Corzine because we knew that he knew about the economy, about the world markets, about how we had to respond.” –Vice President Joe Biden, talking about the people he asked for advice from during the financial crisis. Jon Corzine recently resigned as the CEO of MF Global. The firm declared bankruptcy after making bad bets on European Sovereign debt. The bankruptcy was the fourth-largest financial firm in U.S. history, and the eighth largest overall. We will finish our discussion on return on invested capital (ROIC) this week, but first let’s return to fundamentals. Joel Greenblatt uses (EBITDA minus maintenance capital expenditures (“MCX”) as his proxy for Operating Earnings or EBIT. Many may have not seen the 36-page PDF on placing EBITDA into context*. Once we know MCX, we can subtract that estimated figure from EBITDA to arrive at pre-tax operating income–the bedrock upon which we divide by the amount of capital used to produce such income for calculating ROIC. We will discuss MCX in another post.